NYC air quality is becoming increasingly worse. Data that maps air pollution is generated and geared towards scientists rather than affected communities. We are aiming to humanize this data to make it accessible to the public in order to create positive change. 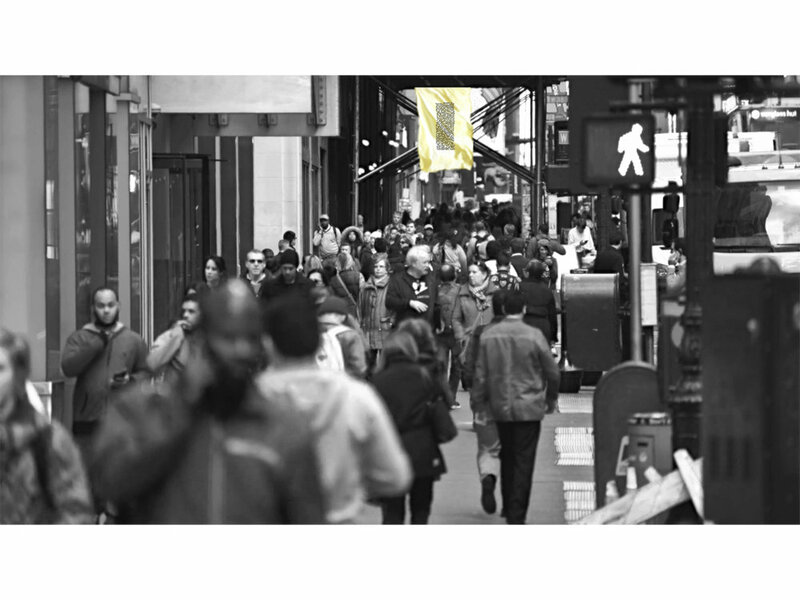 Flags in highly trafficked Soho signal poor air and encourage action while cleaning it. Flags are set at 10-12 feet where air quality is the most toxic. 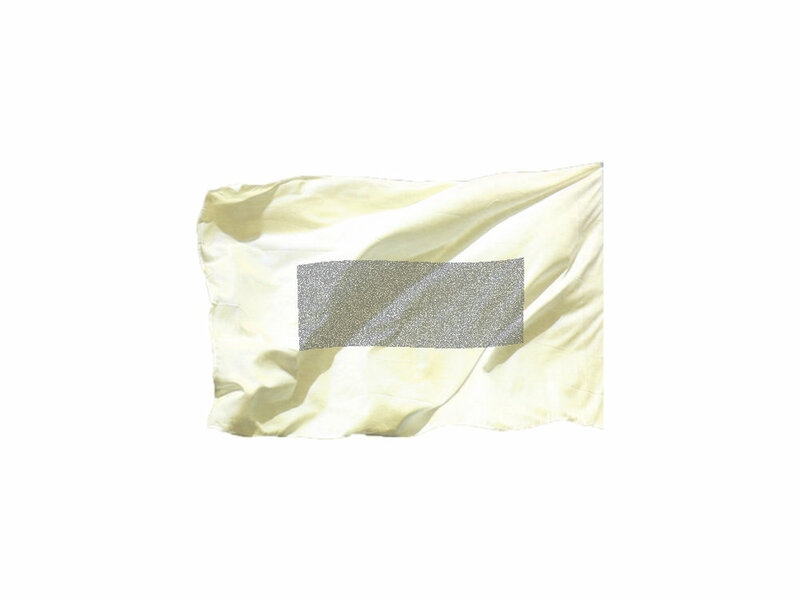 Our two part project, “The State Of Air ” is a digital map and a physical installation of flags. It draws attention to the issue, creates personal agency, while alleviating air pollution. One can search air quality within the context of other environmental assets such as sound decibels, density, level of light, proximity to water, and greenspace. 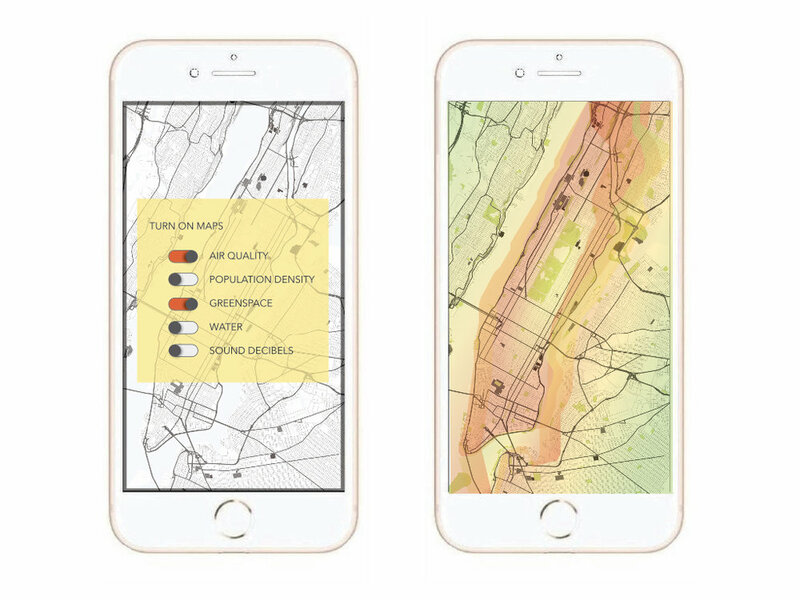 The mapPING APP translates data into an app that allows urban dwellers to navigate the city based on the holistic quality of the natural environment. USERS can search DESTINATIONS BASED ON AIR QUALITY, sound decibels, density, level of light, proximity to water, and greenspace. AGGREGATE DATA WILL HIGHLIGHT THE AREAS WITH WORST AIR QUALITY IN RELATION TO OTHER VARIABLES. The “State of Air” map reflects real time data and directs attention to the natural urban environment and how we navigate it. This map uses four separate real time data sets to generate an interactive map which can be accessed on a phone or computer. It highlights the areas with Good air quality and shows the city as a living breathing landscape. To accompany the map, we are “flagging” the areas with the worst air quality and highest traffic as a way of democratizing the data and cleaning the air in the areas that need it most. 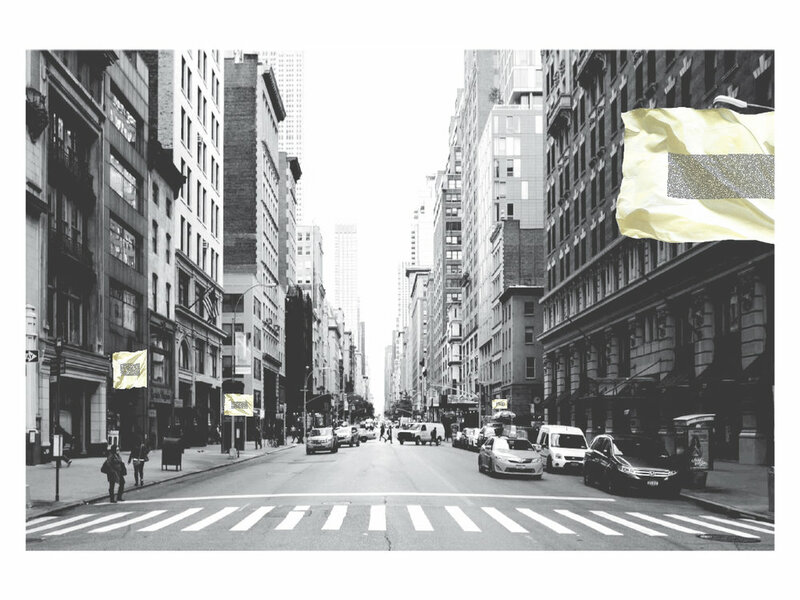 The physical installation translates data OF the most polluted and trafficked areas into air filtering flags. This portion performs as both a PSA as well as a functional filter. Together part one and two of “The State of Air” aim to first contextualize the data to share with a larger underserved audience and then clean the air in the areas that need it most. the state of Air quality in nyc is frightening and it will take collective work to make a positive impact. this project AIMS to not only inform the public but to give them agency. until now, there have been no major efforts in NYC to alleviate air pollution or even to inform the public about it. Using site specific installation and interactive templates to bridge findings of the scientific community with the power of the public. State of Air IS IN the dESIGN AND FABRICATION stages, DEVELOPING A composite filter that combines HEPA, carbon, and antibacterial fabrics. HEPA FILTERS ARE NON WOVENS THAT MUST BE PLEATED TO ACCOUNT FOR BROWNIAN MOTION, NON LINEAR MOVEMENT OF PARTICLES BELOW A CERTAIN SIZE, IN ORDER TO capture PM 2.5. CARBON FILTERS REDUCE VOC’S AND SMELLS, WHILE ANTIBACTERIAL FABRIC KEEPS THE SURFACE STERILE. Map 1: Air quality map uses aggregate data to outline pollution and highlight the non stable nature of air. Map 2: Air quality is mapped in conjunction with aggregate data around traffic, shows the areas with most movement and individuals to mark the highest impact areas to install air purifying flags. 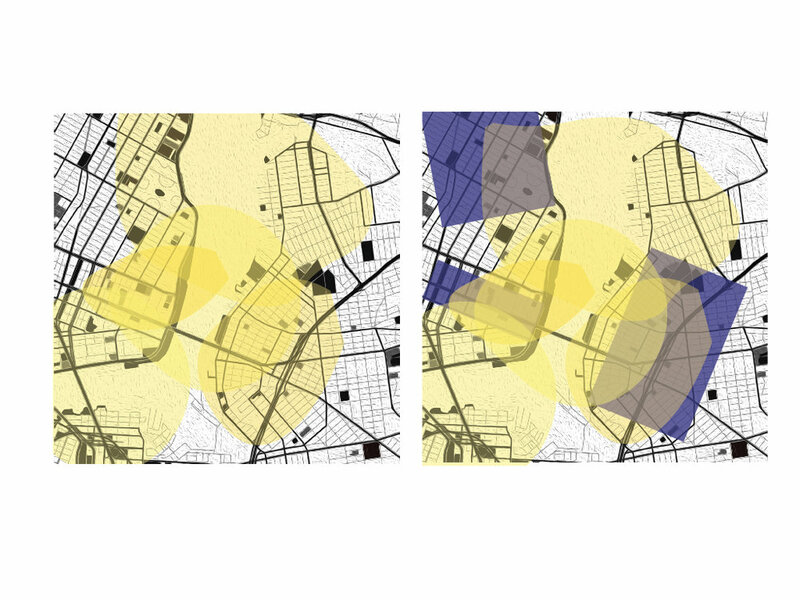 Maps visualizing data of quality of space. Map 1: Aggregate air pollutant levels. Map 2: Water Map 3: Aggregate sound levels.